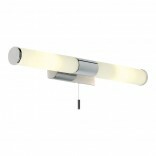 LED Bathroom Lights CategoriesThere are no products in this category. LED bathroom lights or in fact any type of bathroom light differs from other lighting in your home due to the fact that they need to be protected from water, steam and other moisture. All of the lights in our bathroom section have a minimum rating of IP44 meaning that they can be used in an area stretching 0.6m outside the perimeter of the bath and to a height of 2.25m from the floor (zone 2). 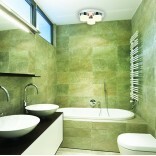 If used in conjunction with a 30MA RCD, many of the lights can also be used above the bath (zone 1). There are many ways of lighting your bathroom from bright bathroom ceiling lighting that will illuminate the whole bathroom to wall lighting and LED strip tape to add style and atmosphere. Just what you need when your relaxing in the bath. 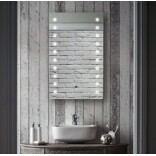 There is also a range of LED illuminated bathroom mirrors to add a touch of modern luxury.